NSU is your place to shine. Student involvement and leadership is all about helping you achieve your personal best. At NSU you’ll find so many opportunities to grow your skills. Or discover new ones you never knew you had. More than 50 clubs and organizations, including academic, cultural, service, athletic, special interest, faith-based and more. A wide variety of intramural sports, including softball, flag football, basketball, volleyball and more. Campus Activities Board: a student-led organization that promotes student engagement through programs and special events. Wellness programs such as fitness classes and monthly educational programs. Multi-cultural events: With students from a wide variety of cultures and backgrounds, we’re proud to support all students in a warm, welcoming environment of mutual respect. Throughout the year, special events, on and off campus, give students an opportunity to meet new people and broaden their perspectives. Your NSU life begins with Welcome Week. Here’s where you’ll meet other new students and dive into all of the excitement and fun on campus. And wait ‘til you experience your first Gypsy Days. It’s a carnival and homecoming all rolled into one. So come to NSU. We can’t wait to meet you! Work out. Play a sport. Take a wellness class. You can do it all at NSU. Interested in playing a sport? 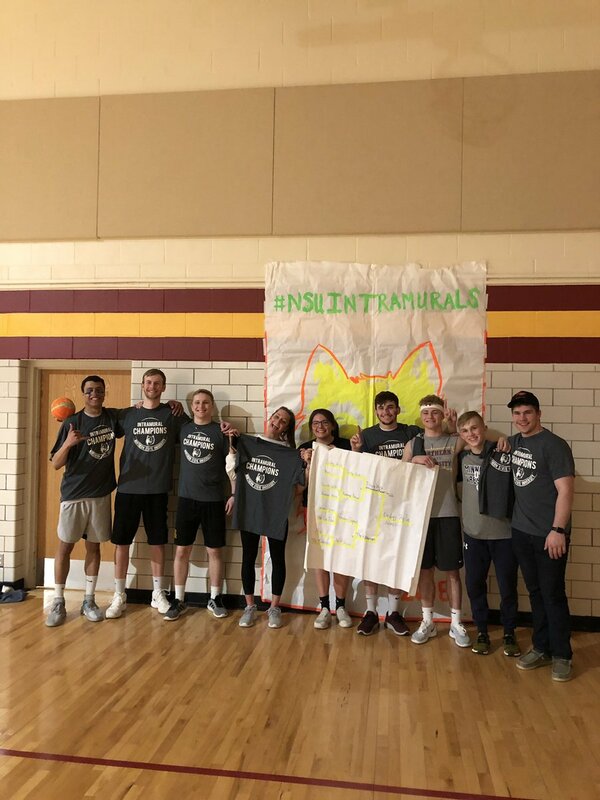 Northern offers numerous intramurals throughout the year, including softball, flag football, volleyball, basketball, dodgeball, and disc golf. To sign up, visit IMLeagues.com/NSUWolves. The Northern State University Student Government Association (SGA) meets at 9 p.m. Tuesdays in the Student Center Missouri River Room. Elections for officers and senators are held each spring. With other South Dakota schools, Student Government Association also sponsors events such as Students For Higher Education Days (SHED). Northern's Campus Activities Board (CAB) is a volunteer, student-led organization that sponsors live entertainment and special events. CAB strives to unify the campus, instill a sense of school pride, and inspire students to become an active part of the community and make the most of their college experience! At Northern, there's a niche for you. Whatever you love, whatever you think you'd like to try - there's a club with members crazy about the same thing, looking for you to join! More than 50 clubs are available to NSU students: academic, cultural, special interest, service, athletic and more. Explore them below! Catch Maroon and Gold Fever during Gypsy Days - a weeklong celebration during NSU homecoming.